Fits Buick Lesabre and Wildcat. Factory style 2 piece top with a plastic/vinyl window with a zipper. We offer it in the original Pinpoint vinyl and the upgraded Sunfast canvas. 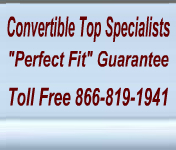 We are proud to offer Robbins convertible tops. Robbins has a worldwide reputation for quality workmanship and precision patterns. They are committed to manufacturing high quality products which offer long term value to convertible owners. Robbins uses only first quality top material and original style components. Combine that with the finest custom workmanship and you end you with long lasting top that fit correctly and look sharp. Robbins has invested heavily in modern computer aided production equipment that produces pieces that are 100% accurate every time. This means that the finished product is consistent and the installed fit is correct. Robbins heat seals reinforcements for extra strength and that prevents side to side shrinkage. Heat sealed reinforcements will not bubble or fail like most glued reinforcements and that means the useful life of the top is extended. All stitching is uniform and bindings are supple and sew on easily without bunching around tight curves. Robbins tops are the preferred choice by professionals. for your new Buick convertible top. This top fits the 1965 Buick Lesabre and Wildcat convertibles, 1966 Buick Lesabre and Wildcat convertibles, 1967 Buick Lesabre and Wildcat convertibles, 1968 Buick Lesabre and Wildcat convertibles, 1969 Buick Lesabre and Wildcat convertibles and 1970 Buick Lesabre and Wildcat convertibles. The finest cloth top material available. Sunfast is 100% acrylic Glen Raven surface cloth. It has a pre-shrunk cotton backing. It is engineered for high tensile and tear strength but the fabric stays soft, supple and color-fast. Sunfast also resists fading and shrinking better than vinyl and does not stiffen up at lower temperatures. Weatherability is superior and excellent durability and low temperature flexibility. 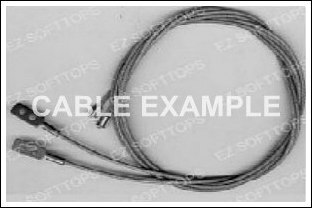 Cables come as a pair.One pair is required per convertible top.The cables are threaded through a sewn pocket on the left and right sides of the convertible top.The cables are required to hold the top snug and tight against the frame.Over time cables can become stretched and/or worn.For that reason it is recommended you replace cables each time the convertible top is replaced.Order one set per car. Pads come as a set. Order one pair per top. Convertible top pads attach to the frame between the convertible top material and the top frame. They lift the top material off the convertible top frame. 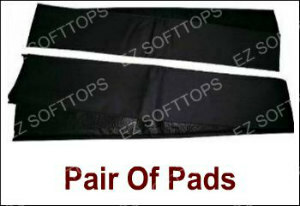 Pads generally can be used through two convertible top installations unless they have been damaged - for example they have been cut, they have gotten wet, or are just very old. The boot has 26 snaps and a plastic slider. The boot covers the convertible top when the top is in the well.It is a nice finishing touch once the top is lowered and it also protects the well area from dust and dirt. The boot has 28 snaps and installs with velcro. The boot has 4 snaps and a plastic slider. The boot has 6 snaps and velcro. 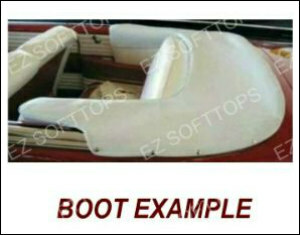 Convertible top installation includes the tack strip that is imbedded in the front bow and rear bow channels. 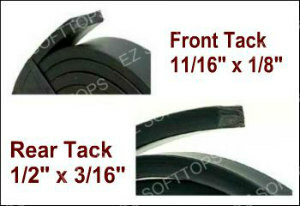 Tack strip will deteriorate over time and the replacement tack strip will give you a fresh new surface to staple into. This rubber tack strip can usually be used many times. The tack strip can be easily cut or stacked as needed. We sell our tack strip in 6 foot sections and that is generally enough for each location. 6 feet front tack strip and it measures 1/8" x 11/16"
6 feet rear tack strip and it measures 3/16" x 1/2"